What Is DA Form 1687? DA Form 1687, Notice of Delegation of Authority - Receipt for Supplies is a U.S. Army document used as a notice about the delegation of authority for receiving supplies. The form can be used to designate authority to sign for supplies or to remove personnel from the list of authorized individuals. A new DA Form 1687 - often incorrectly referred to as the DD Form 1687 - was released by the Department of the Army (DA) in November 2015 with all previous editions obsolete. An up-to-date fillable DA 1687 is available for download and digital filing below or can be obtained from on the Army Publishing Directorate website. What Is DA Form 1687 Used for? The DA Form 1687 is used to designate personnel authorized to request or sign for supplies that require formal accounting at the user level. This document, sometimes informally referred to as Army Signature Card, is often applied to request a receipt for items listed in AR 710-2, Class VII, such as ammunition, weapons, narcotics. Commanders may designate additional items that require control by the DA Form 1687. How Long Is A Da Form 1687 Good For? 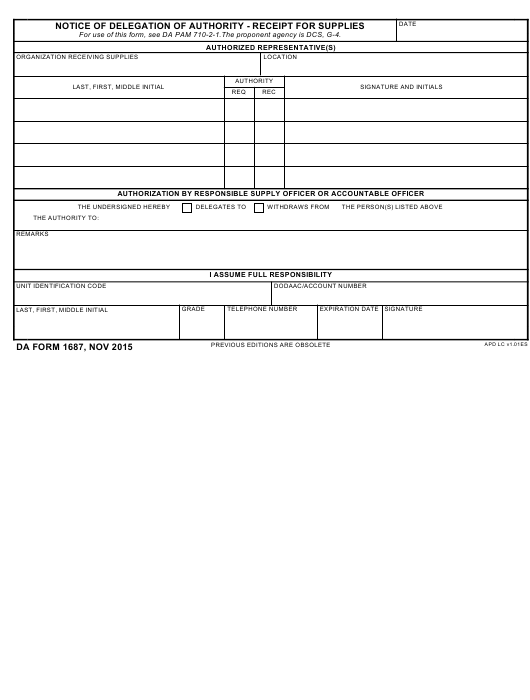 For use of this form, see DA PAM 710-2-1.The proponent agency is DCS, G-4. The Box in the upper right corner that specifies the date must be filled in first. Next, the authorized representatives have to enter their names, location, and authority for every single unit of supplies they are getting from the delegating party. After that, the responsible supply or accountable officer completes the next section of the document, by indicating the type of transfer occurring, and making any remarks necessary to understand the transfer and its reason. The receiving party assumes the responsibility by filling in and signing the last section of the paper. The copies of the document are to be kept by the supplying and receiving individuals. All DA 1687 forms must be kept current. An additional form must be prepared in order to add personnel as authorized representatives or to delete them from the existing list. To add a person to the list, enter the statement "Added, previous editions remain in effect" in the remarks block. To delete personnel, list the names if the persons deleted and enter an "X" in the "withdraws from" block. Circle this block using colored pencil or ink. Enter the words "Deleted, other personnel listed remain in effect" in the remarks block. Deleted personnel do not sign the card. Sign a blank white page. Scan your signature or take a snapshot of it. Save the picture on your computer. Crop the saved signature to its actual size using a picture editor and save. Now you can use it on your Army Signature Card or any other document. The bottom of a DA Form 1687 contains a box labeled EXPIRATION DATE. After the date indicated in the box has passed, the document is considered to be expired and it is necessary to prepare a new card.